baby outfits, and any other memorable fabric. If you are like most people, you have a pile of treasured old t-shirts you just can't bear to throw away. Campus Quilt is dedicated to turning your old clothes into lasting memories in the form of fun and functional t-shirt quilts. We make quilts from Lap sizes up to King size. See our sizes and prices for more information. Recommended as one of Seven Priceless Presents for the holidays. Q: Can I use sweatshirts, ties, or other fabric? A: Yes! Almost any fabric works, and you can mix fabrics in a quilt. What makes a T-Shirt Quilt from Campus Quilt Company unique? Great Pricing : We know that price counts, but you don't want to give up quality. Campus Quilt is able to offer the highest quality at the best prices because we are the largest t-shirt quilt company in the country. Quilting: Many t-shirt quilts are just tacked at the corners. We completely quilt the entire quilt on a commercial quilting machine. Full quilting looks better, provides more stability, and makes your quilt last longer. And it's all included in our price. Speed: We typically finish your quilt in 2-3 weeks. For that last minute gift, we regularly finish a quilt in as little as one day with a small rush charge. Options: You can choose the layout of your quilt, select the backing color, and add extra services like embroidery, photo squares, or sashing. Of course, you don't have to take our word. Every customer is given an online survey. See their unfiltered responses on our customer review page. These reviews are updated daily and we think they are the best testament to our quality and service. "Your customer service went above and beyond my expectations. In the business world today, people say they care about the customer - but their actions do not match their words. Your company is the exception to this statement. It was a refreshing experience to buy from your company. I have to admit I was nervous and a little hesitant trusting someone with my "t-shirt memories." Your excellent communication via numerous e-mails helped me to feel at ease that my memories were in "good hands." To top it off, the personal, hand-written note that came with my quilt was such a pleasant surprise. It seems like no one today would take the time to show the customer they care so much - yet you did. Thanks for a wonderful buying experience!" 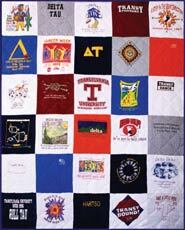 "I received my t-shirt quilt yesterday and I can't tell you how much I love it. You have a first class operation - you kept me informed every step of the way... and the hand-written note was the icing on the cake! I will spread the word to all my running buddies!" I'm so impressed with the workmanship and quality of my t-shirt quilt. The customer service has been outstanding from start to finish, with plenty of extras along the way. I will whole-heartedly recommend your fine service. It has been a total delight!" "I just wanted to say thank you so much for my quilt, which I just received. I was absolutely blown away by my entire experience with Campus Quilt, from start to (a remarkably quick) finish. I so appreciate how quickly you made the quilt, and it's going to make the perfect birthday gift, right on time!"